Driving: Take Crowchild Trail to 33 Avenue SW. St Peter the Aleut Church is located six blocks east on 33 Avenue SW.
All other service times can be found on the parish web site. St Peter the Aleut Church was established in 1990 with the blessing of His Grace, Seraphim, Bishop of Ottawa, Archdiocese of Canada, OCA. 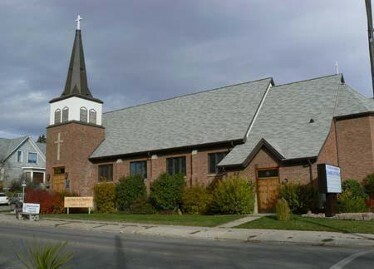 Several families had a strong desire to see an Orthodox parish established in Calgary that used English exclusively as its liturgical language. One of those families was the Deacon Peter Isaac family, a Deacon who had just recently attended St Tikhon’s Seminary and was living with his family in Calgary. Fr Peter was shortly after ordained to the Priesthood. The parish grew slowly, attracting people from a wide variety of backgrounds: Orthodox who had married English-speaking non-Orthodox who were ready to convert to Orthodoxy, lapsed Orthodox who came back to the faith; Orthodox who wanted to pray and worship in a language that they understood; and converts to the Orthodox faith from a variety of backgrounds; as well as recemt immigrants from traditional “Orthodox” countries. After meeting and worshipping in several different places, the parish was able to purchase a building in August, 1997, which has been transformed into an Orthodox temple. The parish is planning to construct a new temple in the near future as God blesses. One of the strengths of St Peter is its diversity of people. Most newcomers feel welcome, no matter what their background. St Peter continues to grow little by little. There is a strong commitment to proclaiming the Truth of Orthodox Christianity to the people of Calgary, and to make it possible for persons who are hungry and thirsty for righteousness to be able to participate in the life of the Kingdom of God in the Church. Persons looking for a place to serve Christ will find many opportunities to do so in this close-knit Orthodox family. Fr Larry Reinheimer began serving St. Peter in 1995.